Not since the late 19th Century has there been a collection of select biographies of Covenanter ministers of the Irish Reformed Presbyterian Church. This definitive volume has been written by 21st Century Covenanters, who have a special interest in the lives of these notable men. 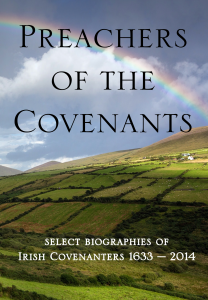 Preachers of The Covenants, records the work of these ministers, who declared not only the precious promises of the Covenant of Grace in Christ Jesus but also that which marks the work of the second Scottish Reformation, with the resulting Covenants and their effect on Ireland and the wider world. These biographies cover over 300 years of Covenanter history and within their historical context, spiritual lessons for today are explored. Almost all of this work has until now been unpublished or not readily accessible. The selection displays the interest of the authors giving a distinct cross section of those who have served as Preachers of the Covenants over three centuries.